After a long morning of fun at the water park, we were all famished. The food at the eatery inside the water park eatery looked really good, even though the selection wasn’t very big. Small baskets of french fries, mini corn dogs, and chicken strips fried to a golden brown, plus hamburgers and cheeseburgers wrapped and placed neatly into rows sat under the food warmer waiting for customers to chose them. The woman working behind the counter noticed us staring at the food and then at the prices displayed on the illuminated board on the wall, and told us that a combination deal was available allowing us to select an entree, a side, and a fountain drink for 10.99. My wife, my son, his friend, and I all placed our selected food a tray and slid them along the serving line towards the checkout counter. After tax, the bill for our lunch totaled over $45. I admit I had a little bit of sticker shock, as that was almost double what I’d normally pay for a fast food meal for four at home. I chalked it up to normal pricing at an amusement park and carried my tray back to our table next to the wave pool. The bun on my hamburger was dried out, the mini corn dogs tasted stale, and the french fries were cold and floppy. We were staying with 3 other families at the hotel in a multi-bedroom condominium at the hotel which featured a full kitchen. The quality and price of the food that sat before us was exactly whey we had been cooking all our other meals back at the room. 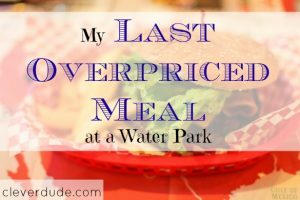 We had decided to eat at the water park for this particular meal for the convenience of not having to get a shuttle back to the separate building where our room was located. I don’t mind paying for good food, or even overpaying a little when convenience is necessary. But overpaying for really bad food had me shaking my head. That’s a mistake we won’t ever make again. The water park doesn’t allow you to bring your own food inside. Obviously they want you to buy their overpriced fast food. If they’re going to have that kind of policy, the least they could do is make sure the food they serve is up to some measure of quality. Do you eat at amusement or water parks, or do you bring your own food along? What’s the most you’ve ever spent on a meal at a place like this? I know how you feel. Happened to me as well but not on a Water Park. We went to this fancy resort that has overpriced meals. We didn’t bring food since I didn’t want to pay the corkage but we could have saved more if we did it. Not to mention we could have enjoyed a tasty lunch instead of eating something that tasted horrible. We try to bring things like powerbars to tie people over until we leave and then either eat at home, or find someplace with reasonably good food like Quiznos, Subway, or Togos. That is nuts! I can’t imagine how they would get away with charging that amount of money. I would personally rather leave and go somewhere more reasonable (and healthy). My parents made that mistake once when we were younger. We never made it again and I haven’t either. You just don’t forget about overpaying for crappy food. If we go, we bring small food items and then get better food when we are done. That’s a drag. We usually pack a cooler with drinks and food. When we stay at a hotel we bring along microwave popcorn for a treat and extra coffee/tea for us grown ups. We have ordered pizza (not my first choice but the kids like it) to our hotel room if we want something hot but don’t want to pay hotel prices. @Mike Goodman – I hear ya’ Mike….and the whole time you’re eating the meal you’re shaking your head and thinking “What a complete WASTE of money.” Am I right?? @Bryce – The kicker was that there was a Subway a block away. I’m sure we’ll be back to the hotel and it’s water park, but like I said, that was the LAST time we eat there! @Daisy – I agree….I went back because I thought maybe I’d make it even worse by buying a slice of pizza for $7.50. It was nasty looking – crusted over, cheese all melted down the side and looked like it had been sitting there for hours. YUK. Quality control please! @Cathie – LOL, the Krispy Kreme IS a hard one to pass by. It’s like the wheel of the car turns itself, isn’t it??? @robert – the only problem (at least here anyway), is that they won’t let you bring your own food in. So, we’d have to go back to our room, or go somewhere where we can eat our own food. Normally that wouldn’t be an issue, but right now it’s frigid outside. We could have easily gone back to our room though…which is exactly what we did the following days! @Grayson – We definitely learned our lesson, and I hope we passed it down to our kids as well. They’ve asked us why we eat at the room instead of going out to eat…so between those two conversations I hope we hammered it home! Thanks for stopping by! Sometimes your amusement park ticket allows you to leave and re-enter, so my family would bring a cooler and go eat lunch in the parking lot. @Laura- In this case, it was an indoor water park inside a hotel (it’s cold in MN this time of year) and we had wrist bands. We were allowed to come and go as we pleased….we would have gone back to our room to eat (which had a full kitchen) and then came back. We thought this one time we’d eat at the park….big mistake!